The METTLER TOLEDO Thornton 3000CS Analyzer is an on-line instrument for direct measurement of chlorides and sulfates in pure water and power cycle chemistry samples. The analyzer continuously monitors these highly corrosive contaminants to assist in corrosion control and minimizing damage to critical power plant equipment. Early, unambiguous detection of trace levels of chloride and sulfate ions is provided with minimal operator supervision. Turbine inlet monitoring: Confirm the steam entering the turbine has chloride and sulfate levels within limits. Boiler feedwater monitoring: Ensure low ppb level contaminants in the water and steam cycle. Condensate monitoring: Detect breakthrough at condensate polisher of contaminants and deterioration of sulfonated cation resin. Makeup water monitoring: Certify that chloride and sulfate levels are within acceptable limits before water is introduced in the water and steam cycle. 1. What are chloride ions? And how do chloride ions get into water? The chloride ion is part of many salts such as NaCl. Salts are commonly found in nature and easily soluble in water, causing chloride contamination. 2. What are sulfate ions? And how do sulfate ions get into water? The sulfate ion is part of many salts such as Na2SO4. Salts are commonly found in nature and easily soluble in water, causing sulfate contamination. In power plants, sulfate ions can also get into water from breakdown of sulfonated resins. 3. What is the effect of chloride and sulfate ions on power plant equipment? Chlorides and sulfates are the most corrosive contaminants in power plant water. They cause corrosion, pitting, stress corrosion cracking, decrease in efficiency with corrosion product deposits, and under-deposit corrosion. These damage expensive plant equipment such as turbines and boilers, leading to unplanned shutdowns for maintenance and repairs. 4. How do you control chloride and sulfate in power plants? Through proper water treatment, quality of the water introduced into the water/steam cycle can be ensured to have low levels of chlorides and sulfates. If excess chlorides and sulfates are found in the water/steam cycle, they can be purged using boiler blowdown and fresh makeup water introduced into the cycle. 5. Where do you monitor sulfate and chloride in a power plant? The most important measurement point in the water/steam cycle for chlorides and sulfates is at the turbine inlet. This ensures that only acceptable levels of chlorides and sulfates enter with the steam into the turbine, the most expensive capital equipment in the power plant. Another important measurement point is after the condensate polisher to monitor for sulfonated resin breakdown. It is also essential to monitor these ions before the boiler, to ensure the boiler is not damaged. It also provides an opportunity to remove chlorides and sulfates from the water/steam cycle via boiler blowdown in case high levels of the ions are detected at the boiler inlet. Low chloride and sulfate levels are ensured in makeup water by monitoring them after all treatment stages, before the water is sent to the storage tank that feeds the water/steam cycle. 6. Are there guidelines for maximum acceptable limits for chlorides and sulfates? Key regulatory bodies and research organizations such as EPRI (USA), IAPWS (Global) and TPRI (China) specify acceptable limits in their guidelines for power plant operation. Turbine manufacturers also specify acceptable limits in their warranties, to ensure optimum performance of the turbine and corrosion control. 7. What are the acceptable limits for these ions? Acceptable limits are 2 or 3 ppb each of chloride and sulfate for makeup water and water/steam cycle. 8. Does conductivity measure sulfates and chlorides? Conductivity is a cumulative measure of all contaminants in water. It does not distinguish between harmful contaminants such as chloride and sulfate, and benign components such as carbon dioxide. It does not provide a ppb-level measurement for chlorides and sulfates. 9. Is there an ideal way to monitor chlorides and sulfates? Chlorides and sulfates should be measured directly at key measurement points in power plants as described above. Measurements should be in ppb of each ion, not a cumulative measurement of all contaminants in the water. Using grab sample to conduct analysis in the lab causes delay in measurements, which could lead to damage to power plant equipment. Such a measurement method also has a risk of contamination while collecting and transporting grab samples, leading to false positives and unnecessary maintenance activities leading to increased plant downtime. 10. What technologies and products can be used to measure these ions? Ion chromatograph – bench top and on-line – provides ppb-level measurements of chlorides and sulfates. Inductively Coupled Plasma with Mass Spectrometry is another technology to provide similar levels of measurement. However, these products are expensive to purchase, operate and maintain, and require trained chemists for operation. Another method to measure chlorides and sulfates accurately, reliably and affordably is an analyzer based on microfluidic capillary electrophoresis. 11. What is microfluidic capillary electrophoresis? Microfluidic capillary electrophoresis uses voltage to separate ions in a capillary. Ions move at different speeds in the capillary based on size to charge ratio, leading to separation of the ions. 12. How is microfluidic capillary electrophoresis used in analyzing chlorides and sulfates? A microfluidic capillary electrophoresis cartridge is used in the analyzer to separate the ions in the sample water, providing concentrated clusters of chloride and sulfate ions travelling through the capillary. Concentration of these ions is measured using a conductivity cell on the cartridge. The concentration of the ions in ppb is then calculated from this conductivity measurement and displayed. The innovative 3000CS sulfate and chloride analyzer uses microfluidic capillary electrophoresis, an ionic separation technology, to directly measure trace levels of harmful sulfate and chloride ions. With on-line measurements every 45 minutes, the 3000CS allows you to monitor your water and steam cycle continuously. 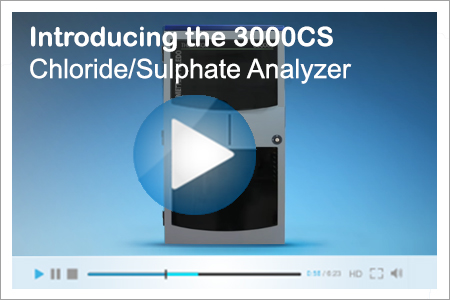 The 3000CS sulfate and chloride analyzer helps you catch contamination early, so that corrective action can be taken to avoid unplanned shutdowns and costly repairs. Typically, chloride and sulfate measurements are done with off-line technologies such as ion chromatography and inductively coupled plasma. These off-line systems are expensive and require additional costs for either internal or external lab work. 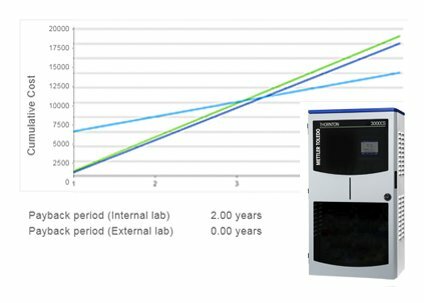 The 3000CS sulfate and chloride analyzer allows you to reduce lab labor costs, while also eliminating the risks and expense associated with a sample being contaminated in the lab. 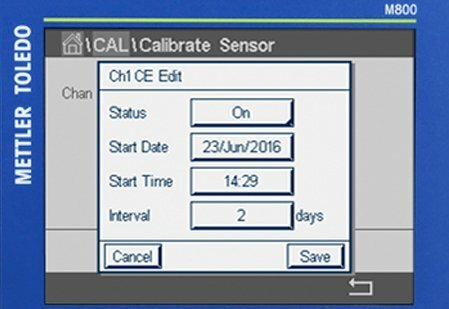 The 3000CS features precise 2-point calibration to help ensure that your sulfate and chloride analyzer is continuously measuring within specifications. The analyzer also has Intelligent Sensor Management (ISM®) technology to provide you with diagnostics that predict when maintenance or replacement of consumables will be required. 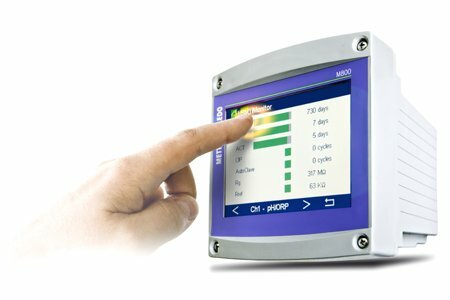 The 3000CS on-line sulfate and chloride analyzer offers an intuitive touchscreen interface, allowing operation without the need of a trained chemist, saving you time and costs. The analyzer also provides trend graphs for chloride analysis and sulfate analysis so that changes in water cycle chemistry and plant conditions can be monitored over time. Read more in the application note about the increasing need to measure chloride and sulfate.